At 10am this morning, Rome time, media accredited to the Holy See received a copy of the Pope's letter to Irish Catholics. Vatican spokesman, Fr. Federico Lombardi, SJ held a press briefing at 11am in the Holy See Press Hall. The letter was to be released to the public at 12:00 pm (Rome time). Journalists filed into the press hall at 11am, filling the conference hall. I found myself seated amongst Irish journalists, all of whom were expressing their personal opinions about the letter and what they saw as the weak points of the letter. They were speaking from the point of view of a church that has been severely hurt and carries several fresh and deep wounds. Fr. Lombardi took the stage alone at 11am sharp. There was an undeniable energy snapping in the air. Each journalist read the letter in a slightly different light and each journalist had slightly different questions. All wanted answers. Regarding logistical questions and legislative documents that might come out of this case, Fr. 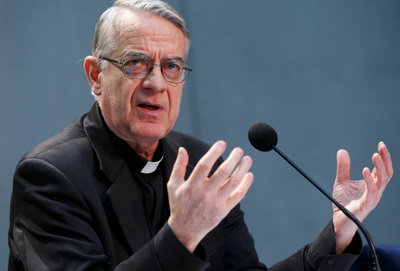 Lombardi said those questions would have to be directed to the appropriate bodies of the Roman Curia. He made repeated reference to Monsignor Charles Scicluna's interview with Avvenire, the newspaper of the Italian bishops' conference. When asked why there seems to have been a reluctance on the part of various ecclesiastical bodies to investigate and apply consequences to priests suspected of abusing children, Fr. Lombardi pointed out that, sadly, in the past, the Church too often made light of the rights established in Canon Law -- the right of the Church to investigate and apply consequences. He said that, unfortunately, sometimes this aspect of the Church's ability was pushed into the background. Fr. Lombardi repeatedly stated that this letter is to be considered a first step of a long journey ahead, the journey to healing. In the press hall after the briefing, journalists typed frantically on their laptops, rushed to get further comments from Fr. Lombardi and burned the phone lines calling their contacts for reactions to the letter. As Fr. Lombardi said in the briefing, this is only the first step. Expect more to be fleshed out in the weeks and months ahead. The full text of the Pope's letter to the Church of Ireland can be found on our blog. The Holy See has also launched a web page with the full text of the letter and links to resource documents, including Monsignor Charles Scicluna's interview with Avvenire. That site can be found on the Vatican website. A hard copy of the letter was to be handed out to parishioners in churches across Ireland and priests were instructed to talk about the letter in their homilies this Sunday.